BBC director general Mark Thompson has written a letter to shadow culture secretary Ben Bradshaw, defending the BBC's independence and impartiality. 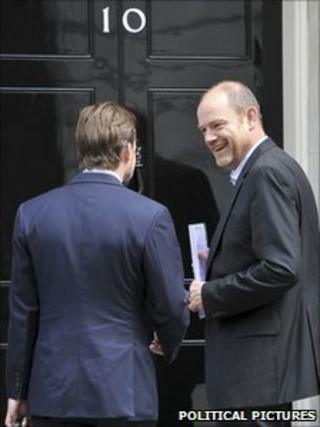 The Labour MP was asking Mr Thompson to clarify the purpose of a visit he made to Downing Street on Thursday. Mr Thompson said his role as editor-in-chief meant he met representatives from all major parties "from time to time". The meeting had been arranged to discuss the BBC's coverage of the government's spending cuts. Mr Thompson said the meeting was "not unusual in any respect". He was pictured walking into Downing Street holding a memo from the BBC's head of news, describing its new season of programmes about the government's spending review. In a letter to the director general, Mr Bradshaw said: "Given the systematic assaults on the BBC by the Conservative Party in opposition and their continued attacks on the corporation in government, including their threats to the licence fee, I am sure you will agree that it is paramount that you avoid any impression that the BBC's editorial independence may have been compromised." He called on Mr Thompson to fully publish the briefing note that had been in his hand and asked if the director general had ever had similar meetings with former Prime Minister Gordon Brown or his political staff. He also asked who organised Thursday's meeting and if other BBC editors had met with Number 10 political staff. In the response to the former government front-bencher, Mr Thompson reiterated the BBC's earlier statement and said: "But I'm happy to assure you that nothing about this meeting - the fact of it occurring, its timing or the matters which were discussed - could be construed as compromising the BBC's independence or impartiality in any way." He said the context of the meetings was "unremarkable" as he had had meetings with the leaders of all of the UK's major parties. "It had been arranged some months ago by mutual consent and was not unusual in any respect," he said. However Mr Thompson did not specifically discuss any particular meetings he had had with Mr Brown. Earlier a BBC spokesman said Mark Thompson had spent the session discussing the possible participation of ministers in programmes about the spending review. He also said the BBC would discuss the issue with all main political parties. Ed Miliband, one of the Labour leadership candidates, had told the Daily Mail the meeting was "deeply worrying". Mr Miliband said that Mr Thompson had "a list of programme ideas which appeared to showcase Tory economic policies of savage, indiscriminate cuts". Labour MP Michael Dugher, once a senior aide to former Prime Minister Gordon Brown, told the Daily Telegraph: "The BBC should be standing up for its independence and should not be bullied by Cameron's aides with the threat of cutbacks." Deputy director general Mark Byford, who is responsible for all the corporation's journalism, wrote in a blog on 2 September about the planned coverage that the BBC "has an important role to play to clarify the issues for our audiences - to help them make sense of different ideas and points of view". "Our aim is to provide insightful, objective programmes and expert analysis to help people understand the context and the potential options," Mr Byford added. Media reports have also highlighted an interview Mr Thompson gave to the New Statesman on Thursday in which he said that, 30 years ago, "there was, in much of current affairs, in terms of people's personal politics... a massive bias to the left".